I confess that at times I buy fabric without any idea what I am going to sew with it. There are usually two reasons for this. 1. It’s on sale. 2. It might sell out and I might miss out on it (usually related to reason 1). And sometimes 3. A false sense of urgency to buy has been created and even though I know this is happening I still fall for it and buy. I don’t think I am alone here. So if I am not alone that must mean that perhaps you, or a quilter friend of yours, do this too and then find yourselves with fabric sitting around in your stash and you wish you knew what to sew with it. Have no fear because today I am here to help with a solution. My fabric for this project. The impulsively purchased charm pack. For the background I had bought a half meter in the summer and then, forgetting that I had it, I bought another half meter in November. I was thinking I would use it with the Cotton and Steel Christmas fabrics but when it came I realized it doesn’t really match with those fabrics. Luckily, it matches with the Cotton and Steel Mesa line. Place each charm right sides together with a background square. 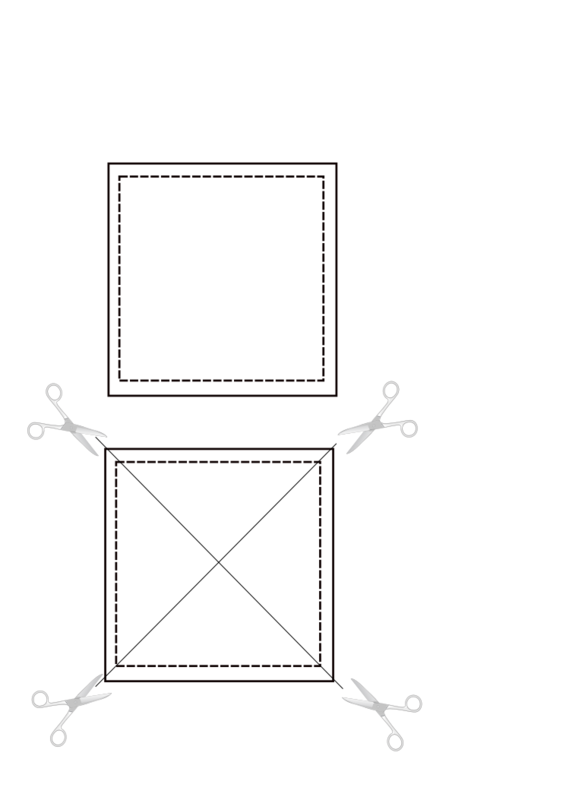 Sew each pair together around the entire perimeter of the square with a quarter inch seam as in the diagram below. Then make two diagonal cuts across the square to yield four triangles which when opened are HSTs (Half Square Triangles) forming a square. This trick for making four HSTs at a time has been around in the quilting world for a while now. I’m not sure who first thought of it but it wasn’t me. I recommend pressing seams open on these HSTs because it will reduce bulk when we put our squares together. We are going to have 8 fabrics coming together at the seams. Now it is time to trim up your squares to 3 inches square. I’m not going to lie… this step is time consuming and tedious but it’s worth it for the accuracy you achieve in your finished blocks. I recommend breaking up your trimming into a few shorter sessions rather than trying to do it all at once. Maybe trim enough for two blocks. Sew those and then trim some more. Or sew two blocks a day. In less than a week you’ll be ready to put your top together. I buy that way too! You are not alone!! Great tutorial! HST's are the best! So much you can do with them. Trimming is my least favorite part, but Bloc-Loc has cut the time in half!! You're welcome Kay. 🙂 I was working it out for myself so I thought I'd share for others in the same situation and I hope it's useful. Thanks for coming by my blog. Hi Jayne! 🙂 Yes I must get some Bloc-Loc rulers. That is a sewing purchase goal for 2016. Less impulsive charm pack buys and more Bloc-Loc rulers. Ha ha! That charm pack was just looking at me from my stash saying "what are you gonna sew with me!?" until I couldn't stand it anymore so I worked out this plan. 😉 Thank you for visiting my blog. Anita, you're not alone:) That's how we build our fabric stash and it always amazes me that when I do pull out some precuts or fabrics purchased way back, they always seem to work (right tone, color, nuance). Thanks for sharing the HST tute. So quick of a block. You're welcome Diane! 🙂 I'm still in the process of trimming all my HSTs but I'm glad I have a goal for this fabric now. I buy that way too, though I'm pretty good at not getting something unnecessarily. I've been collecting great blues and purples to make a big quilt. I wanted to make a bag recently and thought I'd check my stash before I hit the sale at my LQS. I was kind of surprised but also happy to find a few great fabric combinations.